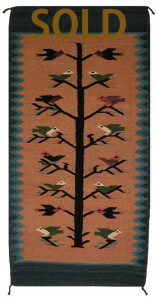 This handwoven Zapotec Mexican rug replicates the classic Bird Pictorial Navajo rug. Pictorial Navajo rugs stem from late nineteenth century attempts by Navajo weavers to record the images they saw in the world around them, and the pictorial weaver often records what she sees. 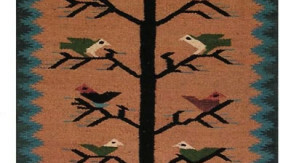 These specialty weavings usually have a light colored background with a wide variety of colors, and depict a cornstalk bearing birds.